Comments Off on Kudos for Andrea Bechert! SJSU RTVF grad Saila Kariat’s feature-length drama “The Valley,” about an Indian high tech entrepreneur whose college freshman daughter commits suicide, is having a Bay Area Theatrical release in Pale Alto (www.bit.ly/thevalleypaloalto), San Francisco (www.bit.ly/thevalleysanfran), and other cities across the country, as well as a simultaneous VOD release. On the heels of a successful film festival run, the acclaimed, award-winning drama will enjoy a one-week theatrical run, opening June 8, in Austin, Boston, Chicago, Dallas, Denver, Houston, Los Angeles, New York City, San Francisco and Washington D.C.; as well as a special screening in Palo Alto, Calif., June 11-12. The film will also be available on VOD June 16 on iTunes, Amazon and Google Play. It was written, produced and directed by SJSU radio-television-film major Saila Kariat in her feature film debut; and stars Alyy Khan, Suchitra Pillai, Jake T. Austin, Barry Corbin, Christa B. Allen, Agneeta Thacker, Salma Khan and Hope Lauren. 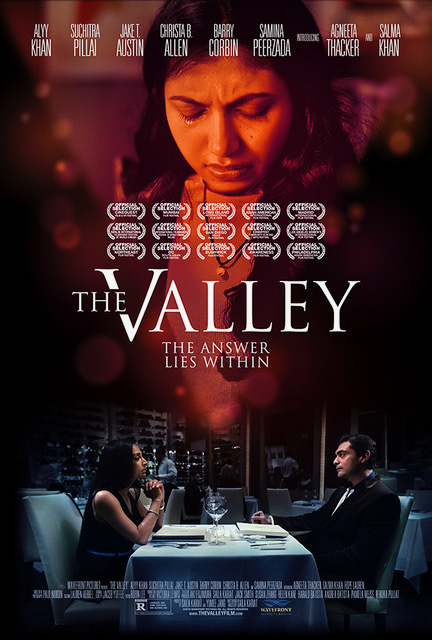 In “The Valley,” ambitious and highly successful Indian-American entrepreneur Neal Kumar (Alyy Kahn) – with wife, Roopa (Suchitra Pillai), and daughters, Monica (Salma Kahn) and Maya (Agneeta Thacker) – enjoy an affluent Silicon Valley lifestyle that appears idyllic, so when Maya tragically commits suicide during her freshman year at college, no one seems to know why. With the family struggling to survive a culture in which relationships and human connection are almost impossible to maintain, Neal embarks on a frantic journey to uncover the truth about his daughter’s death. When he doesn’t find answers at home, he travels to her campus to speak with the people who surrounded Maya in her final days. As work and family unravel in the chaos, the fractured nature of his life begins to become apparent to him and everyone around him. When the elusive reasons are finally revealed – as well as the heartbreaking secrets kept by her and the rest of his family – is it too late for them all to come back together? 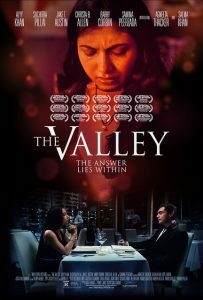 “The Valley” – which also had a week-long theatrical run in April in India in Ahmedabad, Bangalore, Chandigarh, Delhi and Mumbia – has been awarded Best Feature Film, Best Actress (Suchitra Pillai), Best Supporting Actress (Agneeta Thacker) and Best Original Score (Jacob Yoffee), 2017 Long Island International Film Festival; Best Feature Film and Best Director—Female (Saila Kariat), 2017 Out of the Can Film Festival; Best Original Screenplay (Saila Kariat), 2017 Madrid International Film Festival; Best Lead Actress (Suchitra Pillai), 2017 Milan International Filmmaker Festival; Best Film and Best Cinematographer (Paul Nordin), 2017 International Filmmaker Festival of World Cinema Berlin; Best Feature Film Jury Award, 2017 DC South Asian Film Festival, Best Feature Film Grand Jury Award, 2017 Portland Film Festival. More information, and a trailer, can be found at www.thevalleyfilm.com.